I think it’s time for an exciting blog update for the Kickstarter, friends! Today we’re going to spoil something we have hinted in interviews and podcasts. 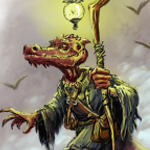 One of my favorite bits from the lizardfolk chapter of the Advanced Races Compendium is the dinosaur-riding option for lizardfolk cavaliers. This book, written by the Four Horsemen, was one of the stretch goals for the Southlands Kickstarter project, which was tremendous fun to work on. Rumor has it that if the Advanced Races Compendium reaches a certain bonus funding goal, those same Horsemen will bestow an advanced race chapter unlike any other. For now, imagine having one of these guys on your side! Some great lizardfolk heroes ride enormous dinosaurs into battle, with ancestral banners and trophies displayed. 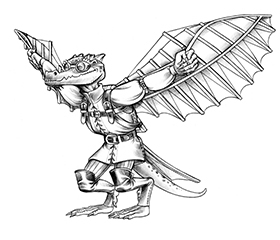 Skills: At 1st level, a saurian champion cavalier adds Acrobatics to his list of class skills and removes Diplomacy from his list of class skills. Saurian Mount (Ex): A saurian champion chooses a dinosaur and trains it as a mount at 1st level. The mount functions as a druid’s animal companion, using the champion’s level as his effective druid level. The primitive champion uses the following statistics for his young mount, which increases in size at 8th level, and again at 15th level. A Medium-sized champion may choose a Large version one of the following saurian mounts (with the mount’s modified statistics included below): elasmosaurus, pteranodon, stegosaurus, triceratops, tylosaurusBEST2, or tyrannosaurus. A Small-sized champion may choose a Medium-sized version of any of these companions. A saurian champion does not take an armor penalty to Ride checks made while riding his mount. The mount is always considered combat trained and has Light Armor Proficiency as a bonus feat. A primitive champion’s mount never gains the shared spells special ability. A saurian champion’s bond with his mount is strong, with the champion learning to climb, guide, and move across his mount during combat. Should a primitive champion’s mount die, he can find and train another saurian mount to serve him after one week of mourning. This new mount does not gain the link, evasion, devotion, or improved evasion special abilities until the next time the champion gains a level. This ability modifies the normal mount feature for cavaliers, and replaces the cavalier order ability. Mounted Acrobat (Ex): At 1st level, the saurian champion grasps the scales of his mount while boarding, riding, or leaping during combat. He can mount or dismount his animal companion as a free action during his turn with a DC 10 Acrobatics check. A mounted primitive champion with a reach weapon may use the weapon’s reach or his mount’s reach for all melee attacks, whichever he prefers. At 9th level, as part of a single melee attack action, the saurian champion can make a DC 15 Acrobatics check. If successful, the attack originates from any square in his mount’s space. In addition, a champion with a reach weapon counts as flanking any creature his mount attacks in the same round. At 17th level, any movement an opponent makes within the reach of the saurian champion’s mount provokes an attack of opportunity from the champion. This includes but is not limited to a 5-foot step, the withdraw action, and forced movement from falling or a bull rush. This ability replaces tactician, greater tactician, and master tactician. 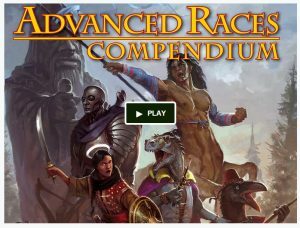 As of this writing, the Kickstarter for the Advanced Races Compendium has funded! Please consider joining in if you haven’t, and if you have? Definitely watch for the stretch goals! Needs an Ankylosauras mount option too! Post “Famine Rocks” on the darakhul banner and I’ll draw up bones ankylosaurus rules!